The E-Myth Revisited: Why Most Small Businesses Don't Work and What to Do About It by Michael E. Gerber. Published 1995 by HarperCollins Publishing. ISBN: 0-88730-728-0 Paperback. 268 pages. $16.00. Michael E. Gerber reworks the concept of the modern business into a model based on planning and building each small enterprise from the ground up as if it were to become a franchise. The methods are based on principles of clear goals, careful planning and the preparation for future success. Gerber is chairman of The E-Myth Academy with over 15,000 clients. The book has sold over 250,000 copies. Start Your Own Computer Business – The Unimbellished Guide By Morris Rosenthal. Published 2002 by Foner Books. ISBN: 0-9723801-0-8 Paperback. 160 Pages. $14.95. Morris Rosenthal takes 15 years of experience in the computer business and condenses it into a book that covers it from the business side. This is not a technical how-to manual about how to service computers as a business but a guide on how to run a small business profitably. Rosenthal is also the founder and moderator of the Computer Business support group on Yahoo with more than 3500 members. AutoPatcher.com, creator of a popular update utility called AutoPatcher, was ordered by Microsoft Corporation to end distribution of the software and update patches for Microsoft Windows from its web site early today. Autopatcher is a utility designed to automate the installation process of Microsoft Windows updates for ease of deployment. It is also portable, which allows administrators of multiple desktops to update PCs unattended using a CD. The utility is popular among computer technicians who work in a mobile environment. Autopatcher.com is based in Greece. The project was started in 2003. In an E-mail sent to AutoPatcher.com, Microsoft said the software, which included a compilation of updates for Microsoft Windows, was unlicensed and unauthorized for distribution by Microsoft. "We hereby give notice of these activities to you and request that you take expeditious action to remove or disable access to the material described above, and thereby prevent the illegal reproduction and distribution of this software via your company's network. ", the E-mail stated. The owners immediately complied with the request and the contents of the E-mail were made public on the web site. Antonis Kaladis, Project Manager and Lead Developer of the program, broke the news to users this morning and removed the downloads, consisting primarily of a collection of mirrors. He admitted they had no other choice. "For the past 4 years, it has been a blast", Kaladis posted. "Unfortunately, it seems like it's the end of AutoPatcher as we know it." Reaction to the news from users was swift and ranged from sad resignation to vehement anger toward Microsoft. "As a support tech I found the AutoPacher essential for saving time and valuable download limits on my broadband account", wrote Bruce Roberts. "I’ll miss you greatly AutoPatcher!" Another user with the handle Zooz said "Autopatcher was a great help and I can’t understand how am I (and others like me) to manage without it". Many users touted the benefits of Autopatcher. Noted one user, whose moniker was Xan, "Autopatcher has been fantastic for me over the years, as with 4 computers on my home network, and only a limited amount of bandwidth, Autopatcher has not only saved me time, but also money that would otherwise be spent on increasing my download allocation!" Another user called JRM said "As a self-employed computer repair technician, you have saved me HOURS patching each machine I have to rebuild, 2 to 5 machines a week". He added, "Using AP I don’t have to physically sit at the machine, use WUS, download and apply the patch(es), reboot, and do the entire thing again". Some users were simply stunned. "I cannot believe that Microsoft did this", wrote Andrew Lucas. "If their software patches are freely available then what is their problem? You are providing a service Microsoft refuses to do". Many, users, however, were infuriated with the Redmond company. "They`re so stupid. How can you take down a nice project like this? ", said someone who called himself Psykid. Dean Sanders wrote, "If Microsoft wants to take every tool away from the end user and leave us with just drm and wga (lawsuits too) then they can keep their software." Another one called Mat said "How can Microsoft have a problem with this? You can freely download any patch from microsoft so what’s the harm in packaging them together?" He added, "The biggest bully in the yard has his way again…". A Microsoft representative was not available for comment. Computer Repair Business: Lessons Learned by Daniel Hand. Published 2007 by Daniel Hand . ISBN: 978-1-4243-3292-2 Paperback. 140 Pages. $29.99 (includes shipping and handling in the US). Written by a computer professional for entrepreneurs, the book uses true stories, examples and procedures for starting and managing a computer business. The author outlines methods based on his own experiences as an entrepreneur that brought him success and explains how that success is in reach of anyone who is willing to work for it. A decision by the Department of the Interior not to renew a 2005 IT lease with a minority contractor resulted in a warehouse full of new servers and data storage assets going to the auction block, according to Chris Rasmus of Rasmus Auctioneers, an online liquidator. 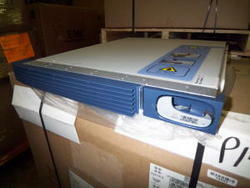 Dulles, VA (PRWEB) August 30, 2007 — A decision by the Department of the Interior not to renew a 2005 IT lease with a minority contractor resulted in a warehouse full of new servers and data storage assets going to the auction block, according to Chris Rasmus of Rasmus Auctioneers, an online liquidator. "It seems like a terrible waste of money," noted Rasmus. "Besides the $15 million in equipment, an additional $5 million in tech-support, user licenses, and support agreements have gone up in smoke." The entire lot, which includes hundreds of Egenera blade servers, EMS data storage arrays, switchgear, and hardware is online to be sold to the highest bidder regardless of price. The inventory will be sold by internet-only auction at 2 pm eastern on Wednesday, September 12, 2007. "The liquidation will be like an eBay sale on steroids," Rasmus said, "instead of selling one item to one buyer, we will sell many to many." For more information on this auction, visit www.rasmus.com. The Canadian company introduced the industry's first 16 port high speed RS232 PCI Express (PCIe) compatible I/O card with a Plug & Play installation in either IBM or Apple compatible chassis. Windsor, ON (PRWEB) August 29, 2007 — Axxon Computer Corporation introduced the industry's first 16 port PCI Express (PCIe) compatible I/O card suitable for a Plug & Play installation in either IBM or Apple compatible chassis. Select OEM accounts have been beta testing the latest PCIe model # LF729KB for over a month. The LF729KB is a 4th generation design foundation to support both Linux and the Apple MAC OS without add-on drivers, without add-on modules and without kernel rebuilds. This support is in addition to the OS/2, QNX and Windows 32/64 bit driver suites. This adapter contains the enhanced Oxford 16C950 UART with 128 byte buffers (8 times competing UART technologies), hardware flow control and 921k communication speeds. "Axxon is clearly the first and leading choice for PCI Express adapter cards. Model # LF729KB is another industry first model to offer support on both the IBM and Apple platforms," stated Kumar Bhatia, Senior Design Engineer for Axxon. "OEMs like Intel, Dell, Motorola, Medtronic and HP/Compaq have been deploying Axxon PCIe cards for years. These ongoing business relationships further validate the compatibility and stability of our products," commented Bhatia. Model # LF729KB is available worldwide with included VHDCI complex cables at a price of $ 599.95 USD (North America). New Web site LaunchALabel.com will bring together 50,000 music fans to start their own record label. Orlando, FL (PRWEB) August 30, 2007 — In the age of file-sharing can 50,000 music fans compete with major labels in an uncertain music industry? 26 year old Florida resident Karol Gajda thinks so. "Music is for fans, not corporations. The future of the music industry will be based on transparency. That is, fans should be a major part of the music selection and marketing processes from the very beginning." For more information visit http://www.LaunchALabel.com or contact Karol Gajda directly at (407) 745-1809. James Dickerson dropped a server on the curb. According to his employer, it's all IBM's fault. T.R. Systems, Inc, a federal contractor located in Virginia, filed a lawsuit against IBM for improperly packing an item after a server worth $1.4 million fell off a forklift during transport from a delivery truck in October 2006. The server, one of two purchased from IBM by T.R. Systems, was being removed from a delivery truck at their warehouse in Alexandria when the accident happened. According to the company, forklift operator James Dickenson was transporting the server when the rear wheels of the forklift hit a bump and rocked the server. "As a result of the rocking motion, the base of the pallet and the crate broke and the crate fell onto the curb, damaging the server packed inside," stated the company in the lawsuit filed in July. The contractor placed the blame on IBM for not properly packaging the server for protection in shipping and would not replace it, requiring T.R. Systems to purchase a replacement. The company contends IBM should reimburse them for the cost of another server. IBM stated it was not responsible for the damage and Dickerson was to blame, saying the driver was not careful in transporting the server across the property. According to the court papers, IBM said Dickerson unloaded the crate and transported it across the parking lot to the warehouse door with the server suspended eight feet in the air. The damage was caused when the server fell off the forklift on its right side and hit the curb, according to IBM. IBM intends to refute the charges. Industrial Nanotech, Inc., an emerging global leader in nanotechnology, announced today that the Company is now in the development stage of a thermal insulation material that will generate electricity. Naples, Fla. (PRWEB) August 24, 2007 — Industrial Nanotech, Inc. (Pink Sheets:INTK), an emerging global leader in nanotechnology, announced today that the Company is now in the development stage of a thermal insulation material that will generate electricity. "After almost three years of research on producing thin sheets of thermal insulation which use the temperature differential that insulation inherently creates as a source for generating electricity, we are moving to the development stage and designing the first prototype material and filing the patents necessary to protect this valuable intellectual property," states Stuart Burchill, CEO of Industrial Nanotech, Inc. "The benefit of a thin sheet of thermal insulation that could be used in the walls or attics of homes or in the walls of commercial buildings and, instead of just helping conserve energy could create energy, is incalculable. The fact that there is almost always, day or night and anywhere in the world, a difference between the temperature inside a building and outside a building gives us an almost constant source of energy generation to tap into," continues Mr. Burchill." Current alternative energy sources under commercialization around the world to reduce dependence on fossil fuels include harnessing solar power, wind power, and ocean wave power. All of these sources have the inherent drawback of intermittent power generation due to the fact that there is not always sunshine, wind, or waves available. "This is an excellent example of Industrial Nanotech's core competency; envisioning ways for nanotechnology to solve important problems for the consumer and use our planet's resources more effectively, executing the scientific research to overcome the technical challenges involved in converting theory into reality, and implementing the commercialization of these products worldwide," explains Francesca Crolley, VP of Operations and Marketing for Industrial Nanotech. "Green Nanotech has always been a focus of our research and development and can provide a means for reducing greenhouse gas emissions and reliance on oil. The growing global success of the Company's first invention, the patented Nansulate line of energy saving protective coatings, and the resulting reduction of energy use and carbon emissions in both the residential and industrial sectors, is a testimony to our commitment to successful innovation and commercialization." DALLAS (BusinessWire EON) August 28, 2007 — Giving small and medium businesses the technology and services they need to more efficient and stay one step ahead of the competition is a top priority for CompUSA. As part of its goal to become the leading technology source for small and medium businesses, CompUSA today announced the launch of free monthly “Put Technology to Work” seminars to help educate business customers. CompUSA’s business services team has designed customized seminars for small businesses with 1-19 employees and events for medium-sized businesses with 20-100 employees. The seminars will educate businesses on important technology topics such as Mobility, Licensing, Disaster Preparedness and other issues that can impact success and profitability. The upcoming free events will be held at the training centers located in the CompUSA stores nationwide. Businesses can make a reservation to attend an upcoming event or obtain more information by visiting www.compusabusiness.com or by visiting a local store. Small Businesses: “Going Mobile” will provide an introduction to Microsoft mobility software to help businesses stay connected while out of the office. The seminar will discuss the use of MS Windows, Small Business Server 2003, Microsoft Outlook, mobile devices and Blackberry Express Server for Small Business. Medium-sized Businesses: “Advanced Business Mobility” will be an expanded version of “Going Mobile” and provide a thorough explanation of advanced systems for mobile productivity, like Microsoft Exchange Server 2007, Blackberry Enterprise Server and Windows Mobile 6.0. Businesses will be able to gain insight into VPN connectivity, enterprise wireless solutions and other mobility issues. Small Businesses: “How to Save Money with Licensing” will cover desktop and licensing solutions and will educate businesses on commercial-grade products, such as the benefits of a commercial-grade desktop. Medium-sized Businesses: “Minimizing Technology Costs” will be an in-depth look at licensing and will cover imaging, asset-tagging, and configuration. More information about these events will be posted on www.compusabusiness.com. CompUSA has served small business customers since 2001 when it launched its in-store business centers to provide support for business customers. In 2006, CompUSA continued its leadership in serving small businesses when it became the first retailer to offer volume licensing to be transacted at retail, with the early availability of Microsoft Windows Vista Business for business customers. In April, through its partnership with Microsoft, CompUSA launched a first-of-its-kind program, CompUSA TechPro Business Providers, which connects CompUSA customers with local technology providers who are Microsoft Small Business Specialists and can provide reliable technical service and support.